Archbishop Michael visited Saints Peter and Paul Orthodox Church in Buffalo NY on 1-2 September 2018. The visit began with a celebration of Great Vespers on Saturday. 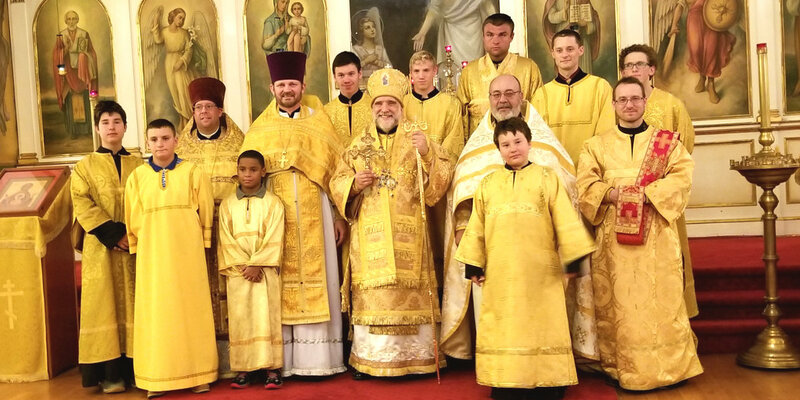 During the Hierarchical Divine Liturgy on Sunday, His Eminence tonsured Caleb Henry to be a reader and blessed reader Steven Camp to wear a Sub-Deacon Orarion. Father Jason Vansuch along with the faithful of nearby Saint George Orthodox Church also joined in the celebration. The Dean of New York state, Father Alexey Karlgut, was present as his wife, Matushka Stacey Karlgut, directed the parish choir. “After each of the services everyone was invited to delicious meals and a time of fellowship during which Archbishop Michael had an opportunity to meet with the faithful and youth of the parish,” said Father Volodymyr Zablotskyy (Parish Rector). Prior to Archbishop Michael’s departure, a discussion took place between Archbishop Michael, Father Alexey and Father Volodymyr regarding plans for the 125th Anniversary Celebration of the parish scheduled for June 28-29 of 2019.